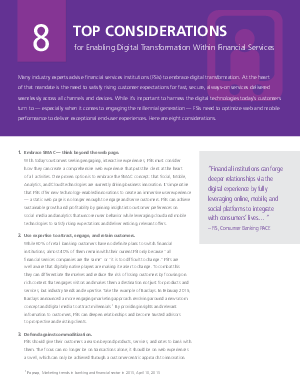 Many industry experts advise financial services institutions (FSIs) to embrace digital transformation. At the heart of that mandate is the need to satisfy rising customer expectations for fast, secure, always-on services delivered seamlessly across all channels and devices. While it’s important to harness the digital technologies today’s customers turn to — especially when it comes to engaging the millennial generation — FSIs need to optimize web and mobile performance to deliver exceptional end-user experiences.